marital bless: That one time. 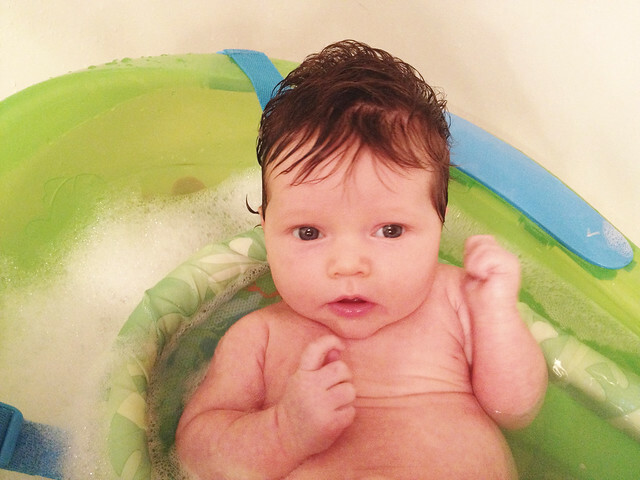 So there was that one time, when I was giving Miri a bath in her infant tub. And I thought nothing of the fact that my phone was near the edge of the large bathtub. Nothing of it as I drained the water from the infant tub. Nothing of it, when Ezra joined us in the bathroom. Nothing of it, until I saw the glow of my phone from just under the infant tub where the water was draining. I put my phone in a bag of rice in an attempt to save it, but this morning, as the apple symbol cycled through, but my phone would not turn on, it was very clear it had no. To add insult to injury, the modem was out on our wireless and with Tony's construction in the basement, I couldn't find it to reset! Due to this, I head out of the house with all three kids, to drop Isaac off at preschool and to bring Ezra to my Mom's, unexpectedly. I nursed Miri there, before going to the Apple store to set up an appointment at the Genius Bar later in the day. Which meant I then went and picked up Isaac, brought him to my Mom's as well, before returning to the mall for my appointment! $200 later and I once again had a phone. You best bet I'll think twice about having my phone near an empty tub again. what about a life proof case ? well worth the $80 - its water/dirt/snow/shock proof. just a suggestion !